When he died in 2008, somewhere amid all the coverage of his vast career, William F. Buckley’s name slipped into my head and waited for me to learn more. Given the sheer breadth of his work, I wasn’t sure where to begin. This release through Thomas Nelson’s Christian Encounters series offers a perfect point of entry. At 144 pages, the book is more of a primer. Jeremy Lott lovingly captures the heart and character of a man deeply committed to his convictions. 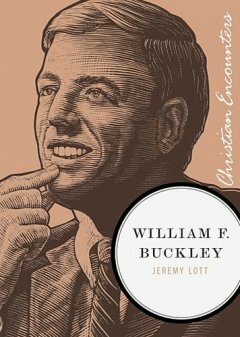 The book covers Buckley’s life more or less in chronological order, beginning with his childhood, walking us through a life shaped by faith, as well as the world evolving around him. Lott writes with readable lightness, humor and intent. He patiently asserts Buckley’s role as a forth-telling prophet and intellectual warrior. As Eliot Ness was to prohibition, you might say Buckley was to the Cold War era, and Communism was his Capone. In a closing appendix, Lott includes a guide for those who would want to read more, and maps out a place to start among Buckley’s numerous books, columns, and segments of “Firing Line” archived on YouTube. The book paints a deliberate portrait of Buckley, addressing his successes, as well as his foibles, with honesty. For an unfamiliar reader, it’s an easy and welcoming place to start learning about a unique and profound individual whose ideas helped shape modern conservatism. Disclosure of Material Connection: I received this book free from Thomas Nelson Publishers as part of their BookSneeze.com book review bloggers program. I was not required to write a positive review. The opinions I have expressed are my own. I am disclosing this in accordance with the Federal Trade Commission’s 16 CFR, Part 255: “Guides Concerning the Use of Endorsements and Testimonials in Advertising. Posts will be sporadic for a while, but I promise, more content is on the way. What’s wrong with the modern novel? Two bloggers at the Telegraph decide to take on that question (H/T: Breakpoint). You can read a lot of novels nowadays that are perfectly good – there’s nothing particularly wrong with them. But there’s also nothing particularly right with them, either. I’d still probably slog through 500 pages of hype-inflated, prize-laden pretentiousness about a lesbian commune in 1930s Cork than the stuff that really sells today: Brown and Meyer. Have you any idea why they do so well? I’m not against bestsellers by any means: Stephen King can write, or so I thought when I last read him, i.e. at about the age of 15. But, dear Lord, surely even during the wrong-headed fug of adolescence I wouldn’t have fallen for The Da Vinci Code or Twilight. Fair enough. I won’t argue at all about the merits of Dan Brown or Stephanie Meyer. If you look at the quality of writing between, say, The Killer Angels by Michael Shaara, and The Firm by John Grisham, there’s a measureable difference. Still, certain bestselling authors, like Orson Scott Card or J. K. Rowling, have managed to move me at least as much the sophisticated literary work of, say, Cormac McCarthy. Even some of Stephen King’s prose manages to rise above the junk food metaphors critics typically wield to strike him down. I suppose in the end though it’s the height of idleness to complain about the standard of modern novels – after all, if I dislike them so much, there’s nothing to stop me writing one of my own. The trouble with doing that, of course, is that I would soon discover that novelists have a far harder job than I’ve given them credit for in this discussion, and so I’d have to relinquish my sniping prejudices and admit that the current lot – Christ, perhaps even Dan Brown and Stephenie Meyer – aren’t so bad after all. And there’s nothing that horrifies a blogger more than the thought of having to relinquish his sniping prejudices. Hell, they’re all we’ve got. After a long hiatus, posts will resume, hopefully by the weekend.